Senate Majority Leader Mitch McConnell made it VERY clear in 2016 — after the nomination of Merrick Garland — that the American People should be allowed to decide when a Supreme Court vacancy happens within one year of an election. This has been called the “McConnell Rule” and we should insist that it is applied now that Justice Kennedy has retired from the bench. So here we are, about five months before the Mid-Term Elections, and there is another Supreme Court Vacancy. We MUST INSIST that the Senate follow the McConnell rule before a new Supreme Court Justice is seated. But Why Would McConnell Listen? One simple reason, the legitimacy of Justice Neil Gorsuch. Neil Gorsuch was appointed as a result of Mitch McConnell’s insistence that, because at the time America was less than one year from an election, that the people NOT THE SITTING PRESIDENT be allowed to weigh in on Justice Scalia’s successor. If the United States Senate appoints a new Supreme Court Justice prior to the 2018 midterms, neither Neil Gorsuch or any decision he has been critical to (including all of the decisions of this week) will be considered legitimate by history. Justice Gorsuch will forever be seen as a McConnell’s hack of Democracy, as a judicial gerrymander, as an ideologue’s illegitimate replacement for Merrick Garland, and as an interloper. All of the 5–4 decisions he was part of will be seen as uniquely questionable and of limited precedential value. Perhaps more importantly, the entire SCOTUS will be tainted forever, reduced in the view of the majority of Americans — like all of our other Democratic institutions — to ONLY a corrupt political body. But there is one other reason he might listen, if President Trump nominates a pro-life judge — and he likely has to (since his base has stuck with him explicitly because they want Roe overturned) — McConnell might not have enough votes to win the nomination in the Senate (Murkowski, Collins, Flake, plus the absence of McCain). But, Mitch McConnell Said We Should Wait For A New President? We are too close to an election to allow President Obama to appoint someone, but allowing President Trump an appointment even closer to an election is totally consistent. There is no functional difference between the impact of a Lame Duck President making such a decision and the impact of a President who could be made a Lame Duck by the outcome of a Mid-Term election making such a decision. Also, and this seems pretty relevant to this argument, President Trump was NOT elected by a majority of the voters in the United States. Mitch McConnell was either correct, or he was literally trying to subvert an elected President from carrying out his legal appointments. 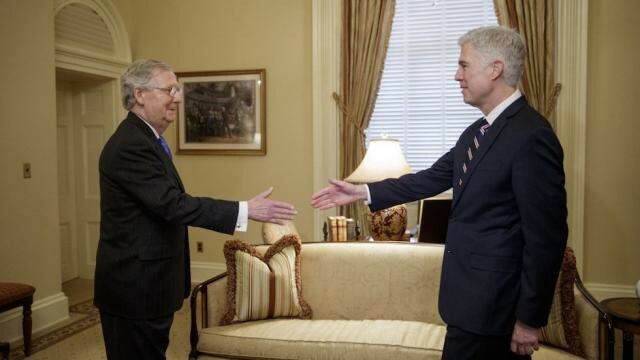 And let us not forget that just yesterday, Leader McConnell tweeted out this image (which has magically disappeared from his Twitter feed since the Kennedy retirement) linking the credibility of Justice Gorsuch directly to his own decision on Merrick Garland’s nomination. If McConnell is taking a victory lap for Gorsuch’s decisions, he should be forced to uphold the credibility of Neil Gorsuch, of the SCOTUS, and to save whatever credibility he has left by insisting the US Senate follow the #McConnell rule. President Trump would be potentially hand-picking a judge that would decide on if he could be indicted as a result of the Mueller probe. President Trump is being investigated for possible collusion with a foreign power and for attempting to obstruct justice. Both of these should disqualify him from choosing another judge before the public weighs in on if his party should continue to hold control of the Senate. In addition, maybe this is a fools errand but just rolling over and pretending it doesn’t matter seems insane. Call your Senators and insist that they demand that Mitch McConnell follows the #McConnellRule. Also, make this an issue in EVERY local, state, and National contest heading into the November election and a battle cry for turning out so that every election result repudiates the President’s likely appointment. Josh is the host of the Decarceration Nation podcast and is a blogger and freelance writer who writes about criminal justice reform, television, movies, music, politics, race, ethics, and more.